My visit aboard the R6 in Barcelona last November 13 was one of the biggest surprises ever experienced. On the outside the ship is compact and has a well balanced design. Her blue hull gives her a lower appearence and she resembles passenger ships of the past. On the inside the R6 is one of the most elegant, more traditional-looking ship on the market with plenty of character, style and personality. A true heir to the ocean liner decoration. Renaissance was founded in the late eighties by the Norwegian owner Fearley & Eger, who built eight small, with all suite cabins, confortable yacht-like cruise ships in two Italian yards. The first four 2,800 GRT ships were built at Cantieri Navali Ferrari and then later four bigger ships at the Apuania yard. The ships made 16/20 day cruises and were able to follow routes of private motor yachts calling at port and anchoring where larger cruiseship could not. Their 100 passengers were accommodated in 50 identical outside suites, and the interior and furnishings were chosen to produce a traditional atmosphere. They were named Renaissance I to Renaissance VIII. But, in September 1991, Fearley & Eger filed for bankruptcy, in one of the largest collapses in Norwegian history. The heavy newbuilding investments ($200 million) and the crisis in the destination oriented cruise business, during the Gulf War, caused a 75 % drop in bookings and was blamed for the company's collapse. Then, some of the first ships of the series were seized and there was some doubt about the completion of the other ships. But, Renaissance was saved from closure after a joint take-over by the Italian Cameli Group and the US tour company Luxury Cruises, controlled by Edward Rudner, who purchased the fleet for $13 million and assumed the debt of $200 million. The completion of the last two units was delayed, and they were delivered in 1992. Under the new management it became promptly clear that the first batch of four ships were too small to be profitable, and were soon sold. The first two are now trading as small casino ships in Singapore and the other two as exploration cruise ships in Galapagos Islands and in the Mediterranean. Later the company also sold the first two of the second batch of yacht like cruise ships, leaving only the 4,280 GRT sister ships Renaissance Seven and Eight in the fleet. It soon became evident that larger cruise ships were needed and that there was a niche market for tour and port oriented medium sized ships, capable of giving all the amenities of the larger cruise ships, but in a more intimate and calm ambience. In the meantime, a Greek ship, the Aegean I, was chartered to offer Greek Islands cruises and, in the autumn of 1996, a contract was signed with the French yard Chantiers de l'Atlantique to build two 350-cabin, 650-passengers cruise ships, with delivery in June 1998 and February 1999. Negotiations for the financial package were the longest in Chantiers' history. The delay was mainly due to the unexpected fall in the US cruise market after the explosion of a TWA aircraft and the bomb at the Atlanta Olympics in July. Then, the original plan for a third vessel was dropped...but later, six more ship were ordered, and the R-series became the second largest in the cruiseship construction history, only surpassed by the Carnival Fantasy's class. Today, Renaissance is the fifth cruise operator, and new and possibly larger ship will come in the near future. Unusually for a series of eight cruise ships of medium size, Renaissance decided to give one man the sole responsibility for the co-ordination of both exterior shape and the interior design of cabins, suites, and all publics areas. The man chosen for this role was the UK designer John McNeece, and the result was an old English estate afloat with dark wood and furnishing. On the technical side, the R-series propulsion are ensured by a diesel-electric propulsion plant. The ships are fitted with four Wartsila 12V32LNE diesel engines, each of 4,860 kW at 720 rpm, all resiliently mounted to reduce vibrations, and two Cegelec electric propulsion motors, each of 6,750 kW. With a cruising speed of 18 knots, these ships have a maximum speed of 21 knots. The vessels are also fitted with SNACH folding fin stabilizers, and a Sperry integrated system. On the "green" side, the waste treatment systems allows waste, including sludge oil, to be recycled or incinerated. Renaissance Cruises has been very successful in selling all-inclusive cruise tours, mainly to the American market. 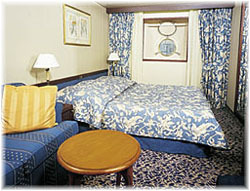 Usually, the pre or post cruise packages, flights and transfers are all included in the very competitive cruise price. The cruise itineraries usually are to particular destinations and to fascinating ports of call in more conventional cruise areas such as Mediterranean, Baltic, Tahiti, etc. Also, Renaissance Cruises was the first cruise line with a completely non smoking fleet. But people are required to take the pledge, and smoking passengers aren't thrown off. It's an elegant way to create a non smoking ambience. Another innovation was the no-children policy, as a direct response to the middle-aged passengers preferences. There are not any amenities for children on board, such as play rooms. This fact means more peace and calm on board, but Renaissance has lost its share of family-market and I think this policy will be relaxed in the future. Another novel aspect of Renaissance was the dining choice, incomparable for ships of this size. There are three restaurants on board, all open seating, a buffet and an outdoor barbecue. You can call room service 24 hours as well. There is no dressing up. As a matter of fact the atmosphere is dubbed as "casual", meaning no tuxedos for passengers and even the ship officers don't wear stripes on their uniforms. The waiters and waitresses are very good and well trained, the service is excellent and the food ranges from good to excellent. The menu changes daily for lunch and dinner. Located on Deck 4, the atrium is discreet in size (only two decks high), but it is beautifully crowned by a lighted glass dome, which gives it a sense of spaciousness. 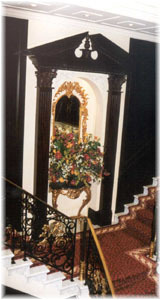 Aft it has a magnificent white marble staircase which divides into two sets of steps at the landing, with a black rough-iron railing, fitted with gold painted flower details. On the landing of the staircase, there are beautifully hand crafted wood classical columns, a big mirror and a big fresh flower bouquet. Passengers enter the vessel on the lower level of the atrium, which houses forward the Reception desk, open 24 hours a day, and is in green marble. Opposite port side is the Excursion desk, also in green marble. Forward there are two columns, splendidly lined and panelled in dark wood. There aren't any cabins on lower decks, and so the atrium works well both as focal point and as reference point on board. The red carpet is the same on both decks of the atrium, and also on the aft stairs, and so passengers soon know when they are near the atrium. On deck 5 (which houses all public rooms), the atrium has less breadth, because this deck houses the lifeboats and tenders. There is a piano on a semicircular balcony over the atrium, and comfortable seating areas both port and starboard, where art work, that the passengers can buy on auction, is shown. The furniture and carpet are the same as on the lower deck and there are armchairs, sofas, with golden upholstery, in splendid combination with the red and green carpets. In this area and in other parts of the ship as well, we can see classical tables with collapsible edges, a splendid nautical detail. Other classical aspect are the curtains, with window shades, that fit almost every window on board. All four restaurants on R-series ships are located aft, and this fact help orientation on board. Aft the atrium, on deck five, is located the main restaurant, with an asymmetrical layout. Its entrance is located starboard. Here we find Club Bar a gathering point, before meals, for friends. It is semicircular with brown marble floor and classical furniture. A nifty divider, in the form of a "faux" fireplace, adorned with a fresh flower bouquet and dummy bookshelves separates this area from the Main Restaurant. The decoration is completed with elliptical ceiling painting, of celestial inspiration, and a big mirror opposite the bar. Here, the carpet is mainly blue with flower motif and the panelling is dark wood. The 370 seat Dining room has a raised central zone, with a blue carpet decorated in floral motif. There are only two wooden pillars. The Captain's table is located starboard aft, while in the opposite corner there is a little stage with a piano, and also a little wooden dance floor, with dinner dancing at night. 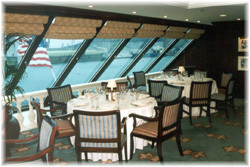 There are three large windows aft, with splendid views to the ship's wake. The space between windows is wooden panelled, with very classical lighting. The ceiling has curved forms, with soft lighting and, in the center of the room, classical paintings. The separation between zones is done through rough-iron glass like railing, the same that exist on the stairs. The chairs are very comfortable and the tables easily seat 2, 4, 5 and 8 people. The waiter stations are numerous and well located, they all have a marble floor, and this helps to give guests an excellent service. There is a cold buffet in the forward bulkhead of the restaurant, though all the food is served by waiters. Undoubtedly, the main restaurant is another design highlight of the ship. Forward of the atrium, on deck five, first there are two shops and then the casino, which occupies all the breadth of the ship. but the R6 casino is diffferent. First of all it has other uses and houses an elegant bar in the center of the room. A calm sitting area is located aft port with a "faux" fireplace, with classical chairs and armchairs upholstered in different colours, surrounding the nautical table with collapsible edges. Furthermore a big monitor describes the cruise calls and the onboard programs. A photo gallery is situated on the starboard side. The photo panels fold away when not in use giving the idea of huge bookshelves and creating a corridor separating the game tables. Dark panelled walls are maintained in this space which gives an elegant and distinctive appaerance. The bulkheads panels are made of the same dark wood that gives coherence to the ship. The casino cashdesk is decorated in the same green marble found in the Reception desk, as well as the Casino bar floor. In this area there aren't any neon, flash lights, noise, etc. This is one of the most elegant casino afloat. The carpet has a combination of blue and red tones. The red tones link the Casino to the red carpet of the Atrium zone and the blue ones link to the forward Cabaret room. The space between the casino and the Cabaret Lounge is realized through a semicircular gallery, with dark wood classical columnes, slightly lighter than the ones found in other rooms of the ship, with golden adornments over green leather, and a splendid hand crafted blue carpet. The roof here is in stucco. This 358 seat room is a nice size (only one deck high) and has two ambiences clearly different. Aft is the bar, anusually low, without stools, and fitted with the same green marble found in the other bars on board. The bar perimeter is slightly higher than the rest of the area. On the starboard side of the bar there is the control room, perfectly dissimulated. Around of the bar there are high tables with high stools, upholstered in blue, though they are identical to the ones existing in the casino. The slightly higher zone has two semicircular counters with blue stools, slightly lower, in order to take a drink while enjoying the show. Forward is the stage, used for bingo, lectures and the shows. The dance floor is wooden with floral details. Don't expect something like Broadway production. The entertainment is low key, but suitable for a destination oriented cruise line such as Renaissance Cruises. The decoration of this part is very classic as well: blue carpet with golden details, blue courtains, and small table lamps that provide an intimate atmosphere. 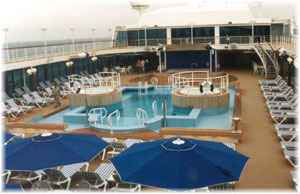 On deck 9, forward the outside pool, is located the Spa, above the wheelhouse deck. 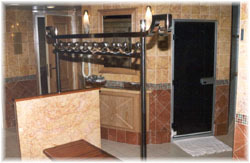 The Spa is managed by Steiner, the well known spa service specialists. All carpets here are in navy blue, with a lot of mirrors on the walls. Almost all floors are marble made and between the male and female dressing rooms there is a splendid Japanese themed painting, plenty of birds. All very sophisticated. The Spa has a horseshoe layout. In the center is located the reception hall, the dressing rooms and the steam rooms. Forward on port side is located the hair saloon while, on the starboard side, there is an ample aerobic room and the gym machines space. Outside sun shades to avoid head-on sun when on the machines. Even here, the dark wood is mantained as the rest of the ship. The forward outside area, sheltered from the wind by blue glass walls, has a little pool for thalasso treatments, with magnificent views forward. The floor here is traditionally teak decked, as well as the chairs and tables, the only ones in teak onboard. The rest are plastic made and I think they should be changed. The outside decoration is clearly less elaborate than the inside one. In other ships of classical decoration such as the Deutschland, the deck decoration is also first-rate. The Card Room is located forward on deck 9 on the port side, and in the later R class ships, this space has been divided into two different rooms. Forward is the card room, with its dark wood panels and classical lamps, of the same type that are used in the Cabaret Lounge, the carpet is mainly blue, and the blue and red upholstered chairs are very confortable, but the ceiling is metallic white, very plain and disappointing and doesn't match the classical decoration of the room. Aft, an ample e-mail room, fitted with seven PCs of the latest generation, has the same decoration as that of the Card Room. There are some old US President portraits, and the tables have wooden partitions for privacy. The partition between these rooms can be open to create a bigger space. The Panorama buffet is located aft, like the other restaurants, on deck 9. It provides diners with a great view of the ocean through large windows port and starboard. There are two sections: the outdoor area is aft, on a teak decked covered terrace, with tables and umbrellas. The "U" shaped inside section has a gay decoration, with yellow and green chairs on the outer side, and drink and buffet table on the inner part, which also incorporates a small pizzeria. The yellow walls have landscape paintings and the area has plenty of light. It's never overcrowded, and there are tables that seat 2, 4, 6 and 8 people. Forward of the buffet is the pool, which is adequate in size for a tour and port intensive cruise operation. Even though some people say that it's on the small side, but not everyone is at the pool on many cruises, especially in the winter European season. The small pool has two Jacuzzis, and a lot of padded chairs. Usually passengers never have problems getting deck chairs or chaise lounges. One deck above, a jogging track circles the pool area and, on deck 11, there is a spacious sunbathing area, sheltered by blue glass screens, fitted with golf driving net and shuffleboard court. There are some tables, with green umbrellas, near the wooded pool bar in the bow section. Aft starboard is also a barbecue, and there is a canopied band stand, that I think is used only in the Tahiti cruises of the R Three and R Four. I think that in a classical decorated ship such as the R6, all outside decks must be fitted with teak. The beige turf doesn't match well with this designed area. On deck 10, above the Spa rooms, Horizons is a multirole space, cleverly designed. McNeece also created the Hemisphere Observation Lounges of the Celebrity fleet, and I think he has a special touch with this type of rooms. This is why we have such an excellent design on the Renaissance. Forward is an observation room, and aft is a sport bar. In the day time it is mainly used as and observation room, with splendid forward views. Like other similar rooms, there are binoculars and nautical memorabilia forward, and also natural plants. The front window slopes towards the inside and is protected from the sun. Behind this slope window a large buff made sofa is fitted, so as to make better use of this space and also to prevent bumping your head. Here the other armchairs are upholstered in blue, the chairs are blue and red with a blue and red carpet. The colour scheme is excellent once again. The windows on the sides have curtains, with window shades, and the floor is lowered to allow views from the center of the room. There are several intimate areas, with big buff armchairs facing the sea, oval tables and red upholstered chairs. In the center of Horizons is located the Sports Bar, the most "American" space on board. Here, the floor level has been raised and a large shell shaped dance floor and a band stage, give way to the bar, which features 8 TV screens that all show a different channel. In the two entrances the walls have dark wood panels, with a lot of black and white photos of famous American sports superstars, such as Bob Beamon, Joe di Maggio, Sam Husf, Pelè, Bill Walton, etc. The library, one of the most splendid library afloat, and quieter than others, is located aft on deck 10. This room has the two alternative restaurants, which open late in the afternoon, nearby and this means that the only movement here is the passengers who want to use the library, furthermore the fact that there are few announcements on board enhances the sense of calmness. It reminds you of the Century's Michael Club, a McNeece's design as well. It's a "U" shaped room, with entrance doors, both port and starboard, and a forward picture window with pool views, fitted with curtains in green tones, and window shades. There are windows on three side. So, the library is very bright. In the center of the ceiling there is a glass dome (like the one in the atrium), which gives it a sense of spaciousness. 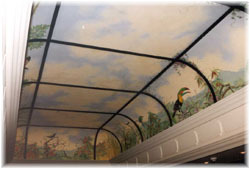 It's painted with birds, and looks like a greenhouse. The library is presided by a "faux" fireplace in green marble, which contains a precious flower bouquet. It has a golden railing with green leather... which is the same colour as the centers of the upholstered tables. The armchairs are also upholstered in various colours (mainly green and red), but all of classical shape. The carpet is red, but has a floral decoration in green. There are Chinese vases here, splendid china lamps, a globe, Egyptian sphinxes, many splendid decoration details, and a lot of dark wood bookcases opposite the windows which give that special "country house" personality to the ship. The library is open 24 hours a day, and there is no control of any sort. Passenger can take the books out themselves and later return them. But they are too busy to have time to read except on longer itineraries. There are no CDs, or DVDs or video tapes. The only modern thing are two PCs, that can be used only for surfing the Internet. As the card room is far, the library also doubles as a card room, and passengers play chess here. According to me the library is the best place on board. 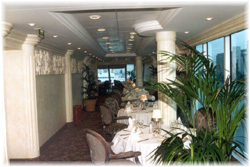 The "R" class cruiseships have three restaurants and a buffet, all located aft. The two little alternative restaurants, are located aft the Library, on deck 10. The seating capacity is 120 passengers each and both have a splendid decor, but I think the better is the Italian restaurant which is decorated in white tones and is very bright. Booking is necessary for these restaurants. Waiting is inevitable, but all restaurants on board have a bar where you can pass your time and meet other people on board. The menu changes every five days. Both restaurant are "L" shaped, with picture windows on two sides. The aft part has excellent sea views through its slooping windows. The Italian restaurant is located on the port side. There is a metope over the inside wall and numerous classical columns, which give this space a Roman feel. Grey and white are the predominant colours, complemented with real plants. The Grill is decorated floor to ceiling with the omnipresent dark wood, with black and white photos of Hollywood stars. All the chairs in the dining rooms are well padded, very comfortable and beautifully designed. The tables are predominantly for four persons. The vessel has a double occupancy passenger capacity of 684 and carries an international crew of 373, giving a splendid crew/passenger ratio of 1.84. All 349 cabins are located on four decks: 4, 6, 7 and 8. The cabin sizes are 14.86 sq. m. (inside), 15.3 (outside), 20.0 (with private balcony), and 49.5 / 55.5 sq. m. (owner's suites with balcony). All have twin/queen bed configuration, TV with movies & CNN, personal safes and hair dryers. 92% of the cabins have ocean views and 232 have private balconies. Even the cheapest room is splendidly furnished, with wooden vanities and blue carpet. The cabins are much larger than I expected. They have more than enough storage and closet space. The bathroom has tiled floor and ample storage as well, and while some passengers had told me that they are small, I found them very adequate. The balconies are very nice, but passengers could enjoy them only on longer trips, due to the port intensive itineraries. The balcony furniture is made of plastic, and once more this is disappointing in this classical ship, as so are the partial balcony partitions. The ten owner's suites are the most spacious cabins on board. They have separate living rooms with dining table, large bathroom with jacuzzi, small bath for guests and extensive private balconies. Six owner suites overlooking the stern, and four more are enjoying prominent positions across the front on deck 6 and 7. The first five ships of the R-series have an entire deck of minisuites and fifteen cabins on deck 3, but the latter trio have all the outside balcony cabins of the same size, and all cabins above the reception hall on deck 3. I think this makes it easier to sell the cruises and improves the orientation on board. The forward stairs and elevators have a red carpet, whereas the aft ones are blue carpeted like the atrium nearby. A splendid way to improve the orientation on board. All stairs have glass railings, which are similar to the iron railings on the atrium stairs. All landings are furnished with mirrors, portraits, and antiques, and the ceiling decoration is good as well. But I think they are small, mainly on lower decks, and in some cases they are cramped. The elevators are not large, but they work properly. The corridors are like all the other public areas in old style with decorated pillars and stucco in the ceiling. On board a medium size ship, the signage is not so important as on large megaships, but the designs of directional signs and directories is good, making the passenger orientation an easier task. Starting January 2001, the ship offered a 25-day sailing from Lisbon to Barcelona, featuring calls along the coasts of France, Spain, Morocco and the Canary Islands. This cruise was followed by 15-day sailings roundtrip from Barcelona. In April the ship will offer 15-day sailings between Barcelona and Lisbon, then she will be repositioned to Dover for 15-day Northern European sailings between Dover and Stockholm throughout August. In September the ship will return to Barcelona and will set sail for a 12- day cruise to Venice then she will sail from tehere to Athens. R6 will conclude the year sailing 15-day cruises between Athens and Istanbul. The R6 is a beautiful and comfortable ship. She is small enough so as passengers are only a few steps away from food, the pool or entertainment, etc. People who had been on much larger ships said they prefer the smaller R6 and her sisters. I never felt crowded when I went aboard. There is plenty of room for seating in the public or dining areas. Passengers don't have to wait for anything. The ship is new and very quiet and so stable that passengers never feel the Ocean. And the staff is second to none. The R6 ceilings aren't as plain as in larger megaships. They are richly decorated, with stucco cornices, tromp l'oeil and many other interesting decorative touches. This level of comfort is the most outstanding feature of Renaissance Cruises. The space per passenger ratio is one of the highest in the cruise industry today, and the rates are lower than other luxury ships. Renaissance also provides one of the best vacation values you could ask for. If you choose to have a great casino, midnight buffets, Broadway style theater and frenetic onboard activities and you don't care where the ship is going, you can pick one of the megaships that cruise the Caribbean. If your choice is great places to visit while enjoying good food and clean rooms with superior service and modest casino and shows, you cannot do better than Renaissance Cruises, that is more low key and classier, as her overall classier clientele expectation.